Japan is a sovereign state in East Asia located on four main islands (Kyushu, Shikoku, Honshu, and Hokkaido). In addition to that, there are more than 4,000 smaller islands that are part of Japan, including the Ryukyu Islands. 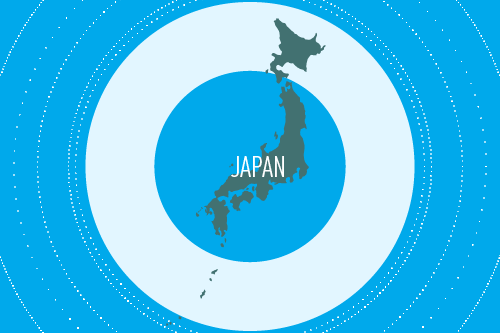 Japan is located in the Pacific Ocean and is bordered by the Sea of Okhotsk, the East China Sea, and the Sea of Japan. Contrary to popular belief, Japan is not a tiny country. Its area is 377,972 km², and it is larger than the major European countries of Germany, Italy, and England. Japan has a very high population density. As of 2016, around 127 million people live in the country. To compare: the US has only 2.5 times more population, while the area is 26 times larger. Japan ranks ninth in the world on the global competitiveness index (according to Statista). The country has been able to reach such high rates because of their high level of robotization of labor and the application of technology in all aspects of life. 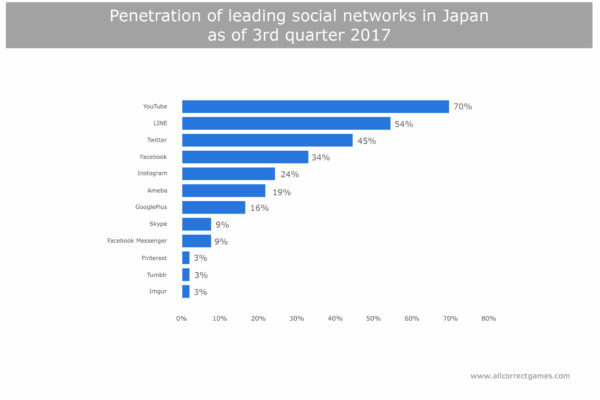 Japan has one of the highest levels of Internet penetration in the world. Ninety-two percent of the population constantly use the Internet. In 2017, the total volume of the Japanese video game market was 10.657 billion USD (according to Statista) or 12.5 billion USD (according to NewZoo). Such a significant discrepancy can be ascribed to the fact that Statista’s methods don’t take into consideration the sales of physical copies and free-to-play client games. Japan was the first country to feature non-preset mobile games. A cultural layer formed in the country, based on the possession of a mobile telephone, an important part of which were games. Back in 1999, users could download games to their phones from the NTT DoCoMo platform. These games included Dragon Quest and Final Fantasy. According to Statista, the mobile market generates 58% of all revenue. This came about for two reasons. The Japanese mobile market is more developed and has existed longer than the majority of other markets in the world. Japanese gamers will pay more in-game than gamers in other markets. The launch of an application in this region must be done with the utmost sense of responsibility. One of the characteristics of a mature market is when consumers begin choosing quality goods and rejecting low-quality ones. 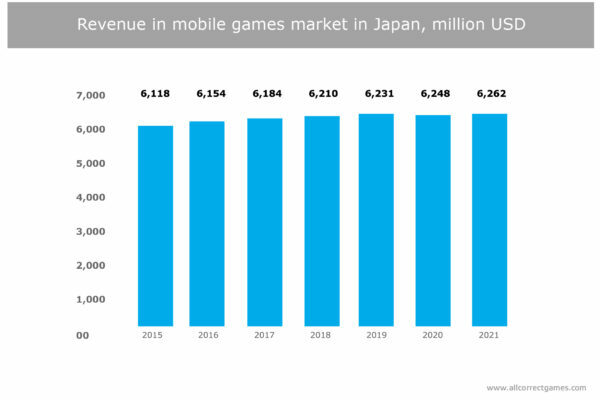 In Japan, the mobile market’s revenue in 2017 was 6.184 billion USD. This is 0.5% higher than in 2016, but analysts predict that by 2020 the growth will slow to 0.2%. These low growth numbers signify that the market has shifted from the growth stage to the maturity stage. 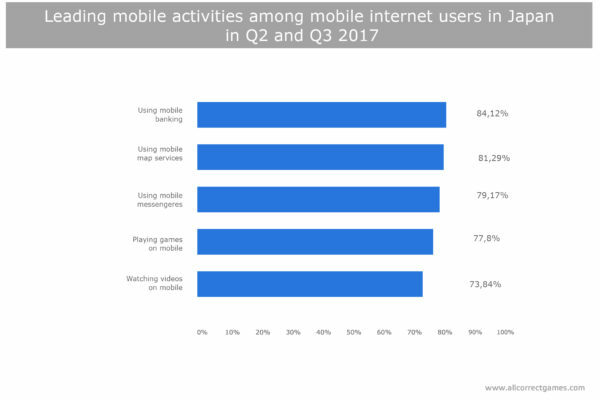 According to 2017 Statista data, 68.5 million users are playing mobile games. Internet penetration is about 54.1%, so more than half of the population of Japan plays mobile games. 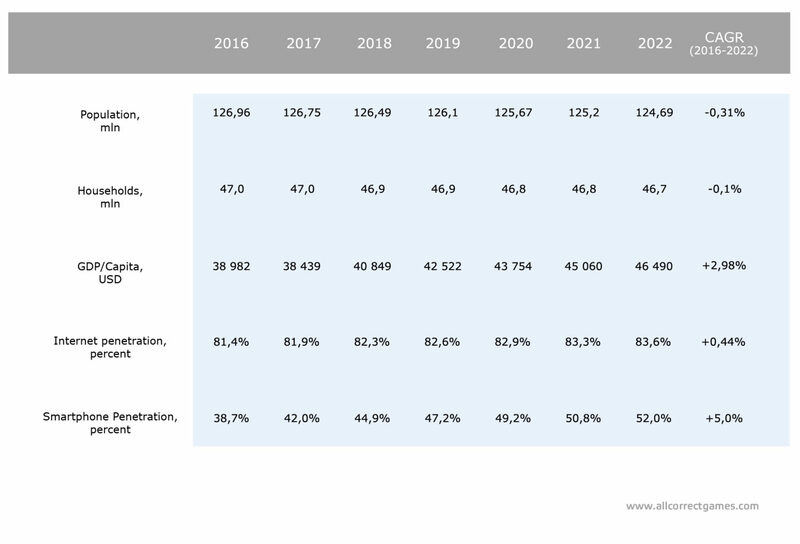 If we are to believe the predictions, by 2022 this percentage will increase by only 1% and will be 55.1%. At the same time, figures are much lower in the Asia-Pacific region. According to NewZoo, the average Internet penetration for games (not just mobile) in the region is 28.3%. 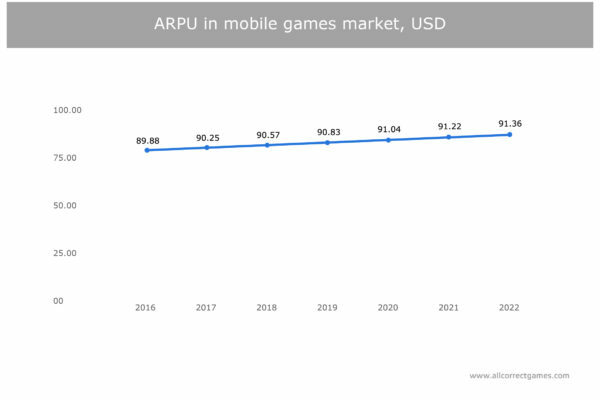 In 2017, the average revenue per user (ARPU) in Japan was 90.25 USD, which is three times higher than the world average (30.64 USD). This confirms that people in Japan pay a great deal in mobile projects. This ARPU could be linked to more than high economic development and the loyal attitude of Japanese people towards payments. Without a more detailed analysis of payments, it’s difficult to say how much comes from market giants and how much comes from other projects. From the high ARPU comes a high cost of attracting customers. According to Chartboost, one user on iOS costs on average 2.57 USD, and 1.97 USD on Android.  You can see the actual cost per install (CPI) by genre by using the calculator. 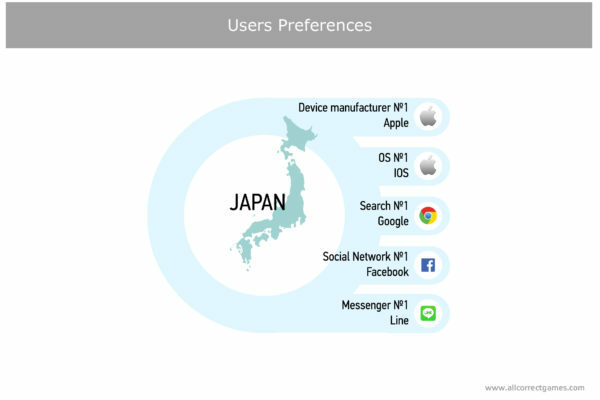 In Japan, 67.38% of devices are running iOS. 31.74% of phones and tablets are running Android. 68.95% of phone users have Facebook, and 13.64% have Twitter. Completing the top three is Instagram, which accounts for 7.38% of users. Who plays mobile games in Japan? 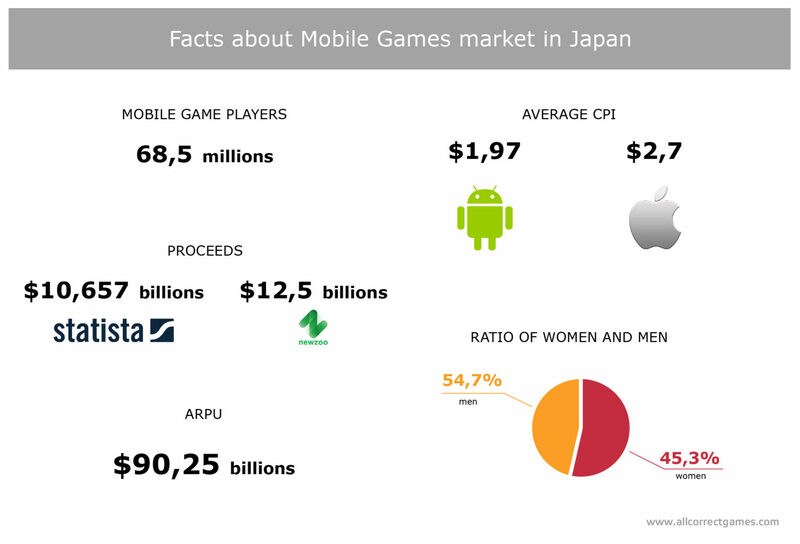 Out of the 68.5 million Japanese people who play mobile games, 54.7% are men, and the remaining 45.3% are women. What’s interesting is that a large number of gamers are 35–44 years old. This group accounts for 35.1% of profits. The elderly population plays fewer games: they account for only 5.4% of profits. In 2017, Monster Strike brought the most profit on the Japanese market. This game is an interesting mix of Angry Birds and Pokémon, which came out in 2013. It’s not surprising that there are only a couple projects in the chart that are well known to western audiences: Lineage 2 Revolution and Pokémon GO. Apart from those, Japanese gamers preferred their own domestic franchises: Monster Strike, Fate/Grand Order, Dragon Ball Z, THE IDOLM@STER, and GranBlue. It’s interesting that the fifth game on the chart was Disney Tsum Tsum. The line of merchandise of the same name is very popular in Japan among both children and adults. It can’t be said that Japanese people prefer a certain genre; in fact, they have more diverse taste than Europeans. Also, there are no representatives from the strategy genre in the top ten by profit, and also no Match 3 games. The Japanese market may seem pretty unique to a European. Pop culture is very intense in Japan, so games related to pop culture often have high ratings. This also explains the profitability of THE IDOLM@STER, Disney Tsum Tsum, and Jikkyou Pawafuru Puroyakyu, a baseball simulator (baseball is very popular in Japan). To developers: for a more successful marketing campaign, prepare and redraw your characters in anime style to use them in ads and app store optimization (ASO). In addition, use big, highlighted letters and arrange captions with images in screenshots at an angle. At DTF, Pixonic told about the nuances of marketing in Asia. We encourage you to check the talk. There are no foreign companies in the top ten most successful developers in Japan. This once again proves the uniqueness of the country’s gaming market, where only domestic companies can really compete. It’s easier for smaller companies to launch applications on the Japanese market with the help of local partners. For developers, it’s difficult and time-consuming to release projects in Japan on their own, but Pixonic’s experience shows that it can be done independently. In this case, plenty of attention must be given to marketing. Japanese is the national language of Japan. Around 140 million people speak fluent Japanese. It is the native language of 125 million people. This makes Japanese the ninth most widely spoken language in the world. 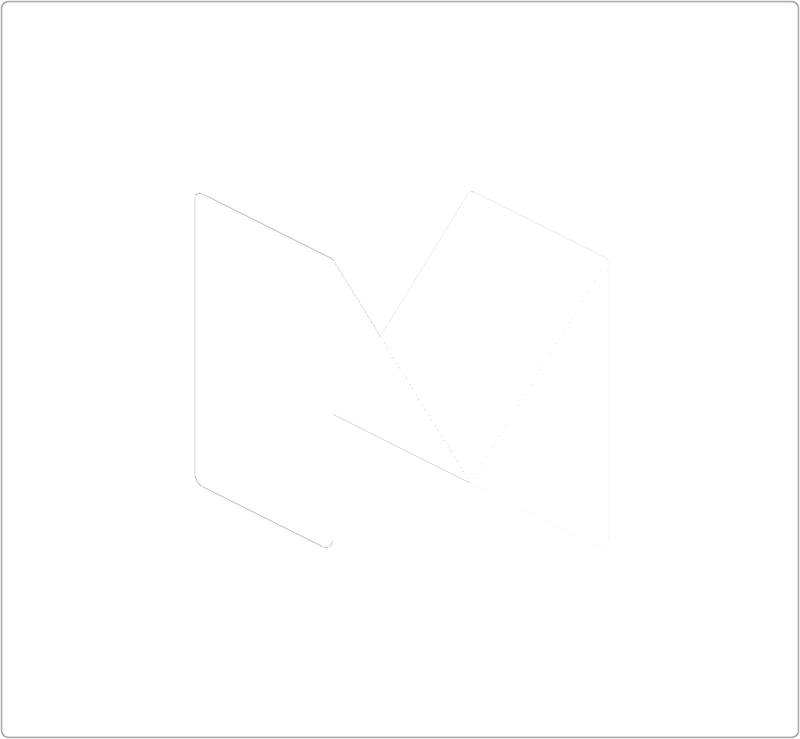 It has its own unique writing system that combines ideography and syllabic phonetic writing. Japan’s unique geographical features—its multiple isolated islands and high mountain ranges—prompted the formation of more than a dozen dialects. They differ in vocabulary, morphology, usage of particles, and, in some instances, pronunciation. Widely spoken dialects include Kansai-ben, Tōhoku-ben, and Kantō-ben, the dialect of Tokyo and the surrounding areas. Speakers of different dialects often cannot understand each other, although every Japanese person knows standard literary Japanese, as it is the language of instruction in schools. The biggest language differences lie between the southern (Ryukyu Islands, where people still speak Ryukyuan) and northern prefectures of Japan. From a localization standpoint, standard Japanese is the obvious choice, as it is understood by all Japanese people. Standard Japanese is known as hyōjungo (standard language) or kyōtsūgo (common language). Although it is based on the Tokyo dialect, it is not spoken in Tokyo. Japanese also has the concept of keigo (respectful language). This style of speech features the use of honorifics. In certain situations, the use of honorific speech is simply unavoidable. The form of address can indicate social distance or a difference in position, or bring intimacy or gentility to a conversation. The honorific speech system in Japanese is complex. It contains various ways of expressing oneself in a range of social settings, divided into humble language and respectful language. Female speech is typically more respectful, using a greater number of honorifics. Even in informal settings, Japanese women choose a more delicate conversational style. This means that it is important to have a clear picture of a game’s target audience when localizing into Japanese. The high variability of vocabulary and orthography makes Japanese difficult for localization. Japanese uses several different writing systems: kanji, comprising more than 2000 Chinese characters, most of which can be read in different ways (on’yomi, kun’yomi, etc. ), hiragana and katakana, known under the shared name “kana”, and rōmaji (romanization of Japanese). The choice of writing system is determined as much by the rules governing their use as by the writer’s or localizer’s personal preference. Japanese language, like Japanese society, is changing rapidly. At the same time, language norms are not centrally controlled by the state. This distinguishes Japanese from other languages such as French (one of the aims of the French Academy is to preserve and protect the French language). Styles are also a distinguishing feature of different generations. For instance, young people prefer katakana to kanji, while the older generation sometimes will be unable to understand modern katakana terminology.